There is an old question that has entertained the minds of many thinkers who look to art and wonder whether it is a mirror offering a reflection of life itself. Art has the power to evoke the same emotions, thoughts, moral and ethical controversies, and conflicts that we experience in life. Anyone who has had a personal reaction towards a work of art will be in agreement. What is it then about the essence of art and the essence of life that are so unmistakably different? Is it a possibility that art gives humans the opportunity to experience phenomena that are not accessible in quotidian life? Is art merely an imitation of life as Plato once asserted with such conviction, or is art a freestanding sphere in which humans can learn in exceptional ways? Through the deliberation of such questions the artist can perhaps move closer towards understanding his tremendous capacity to illustrate our existence in a distinct and remarkable way. The Greek philosopher Plato declared the artist to be “an imitator of images and is very far removed from the truth” (Republic X, 27). Plato was certain that art was nothing but a dangerous and shallow imitation of life that served only to draw humans far away from the Truth. This unique concept of ‘Truth’ refers to the idea that the purest existence of any given thing lies not in the physical manifestation of the thing itself, but rather in its invisible and eternal ‘Form’. Let us take an example of a table vs. The Table. Any given table is a table that has been modeled after the eternal form of The Table. Somewhere in an otherworldly domain, alongside all the other eternal forms of the universe, exists the One and Only Table in all its truth, purity, and Tablehood. The carpenter may look towards but not at the Form of the Table (or else the carpenter would be God and at which point probably no longer a carpenter) in order to produce, or ‘mimic’ a lesser yet sufficient model of The Eternal Table. In a similar way the artist can be compared to the carpenter, only deserving of less respect according to Plato. The artist does not look to the Form of Beauty, say, but rather looks to the physical image or projection of Beauty. This removes him even further from Truth than any other ordinary laborer. The artist is in this way an imitator, and art is a ‘mimesis’ or imitation of the visual display of Eternal Forms such as Beauty. Consequently it is Plato’s persuasion that art as a mere impression of life is detrimental to the inner soul and its understanding of righteous Truths. Unlike Plato, Aristotle believed that objects contain their own eternal truths different in nature from their universal Forms. These truths are not the esoteric and inaccessible truths that Plato refers to. These truths are the exoteric products of the human psyche; products of artistic contemplation. Aristotle invites us to realize that although artistic depictions may be based on an “outward appearance”, these depictions are a means to communicate an artist’s “inward” experience of the physical world. 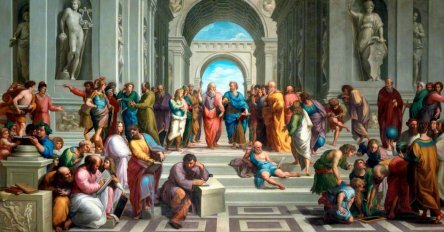 An interesting visual allegory to the differing sentiments put forth by Plato and Aristotle can be seen in Raphael’s painting The School of Athens. Aristotle holds his hand out level with the earth and towards the human viewer. This is an allusion to Aristotle’s notion that the truth resides on earth and within the human anima, or soul, without having to look to Platonic Forms. Art is our tool to relate this truth. Answers come from within. Those with a will to closely represent nature through artistic means can surely find validity in Aristotle’s assertion. The study of the human figure is an impeccable example. Much time can be spent studying the functions, appearance, and overall nature of the human forms to achieve great artistic representational abilities. Additionally, I dare to say that when the artist masters an understanding of and ability to describe the subtle human forms he can truly do the same for all subject matters. The human body is such a symphony of variety that through its investigation much about nature as a whole can be understood. We can say safely suggest then that even though any given human body is just a physical vessel or ‘manifestation’ as Plato would readily discredit it, that same body can offer us infinite teachings about Man, Beauty, Nature and more. It is regardless and irrelevant if these truths are conducive to understanding eternal Forms or not. Aristotle helps us remember that while art is indeed an emulation of life, it is not its slavish imitation. Here perhaps our question regarding the divergence between art and life can be answered. We live our own lives on a highly personal level; we learn from our own experiences. The audience of the arts is granted the opportunity to not only see the world itself reshaped in artistic medium, but the way an artist, a person who is not ourselves, sees the world; his unique understanding of reality. Knowledge can be achieved through our own eyes, but perspective can only be obtained by seeing through the eyes of another. The artist is in this way praised, not condemned for bringing humanity towards understanding of personal truths. Art provides us with an understanding of the world that goes beyond that which is offered by the real. Let us return now to the question: Does art imitate life? Yes, however it is not a work of art that makes a conscious decision to do so. It is the artist. The artist looks at, into, around, and towards life. After feasting on all that it has to offer he emulates life in artistic mediums. But this process is not of the same connotation implied by the question: a Platonic imitation lacking in originality and purpose. Imitation is not such an obsequious mechanism. Imitation is in fact what all origination is based on. Babies do not create a language and know it, but mimic the words they are told day by day until they become fluent speakers. Aspiring musician and artists must repeat and copy the works of the masters before having the adequate tools to create their own. In fact, I see it as likely that our entire existence and success is a result of imitating and later personalizing that which we witness. Psychologist, philosopher, and author Susan Blackmore writes in the opening words of her essay Imitation Makes us Human: “To be human is to imitate. This is a strong claim, and a contentious one. It implies that the turning point in hominid evolution was when our ancestors first began to copy each other’s sounds and actions, and that this new ability was responsible for transforming an ordinary ape into one with a big brain, language, a curious penchant for music and art, and complex culture.” If this is true then imitation is the catalyst of our understanding and growth and not its preventer. Art is an imitation but is also a freestanding realm in which truths are revealed and made ready; truths that life alone cannot divulge. If we can embrace this idea of imitation as an indispensable part of creation we can see how our current idea of originality is a paradox. Nothing truly ‘original’ exists, for everything is a product of a predecessor. No man is an island. No idea is without inspiration. All is interconnected, a part of the whole, and just as art could not exist without life, no artist could bear fruit without being nourished by the truths of those to him akin.